According to the United States Department of Agriculture (USDA) termites cause an estimated $5 billion dollars of damage a year in the United States. Termites cause more damage than fire, floods, and storms combined. The Formosan termite is one of the most destructive termite species in the world and now infests more than 14 states according to the USDA. 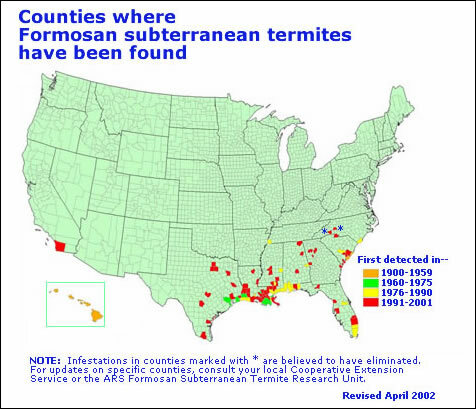 Originally limited to Hawaii, the Formosan termite is now well established throughout the southern states in and around the Gulf Coast, and spreading rapidly. Cold-formed steel (CFS) is one of the recognized methods for compliance with the termite-resistant construction requirements of the International Residential Code. Choose CFS and do away with the worries about exclusions in the fine print of warranties for treated wood or the presence of chemical treatments in your building or soil. CFS is inorganic and does not provide a food source for termites. 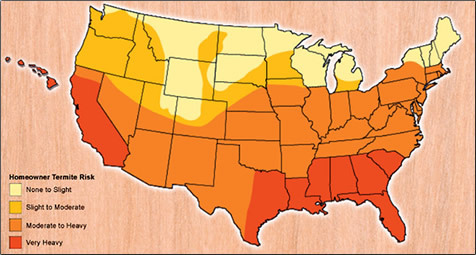 CFS provides a healthy building with no off-gassing from chemical termite tr eatments, or pressure treated lumber. Termite damage is rarely covered by insurance. Build it right and avoid costly problems later. A 2009 survey of homeowners in Hawaii, where the Formosan Termite has radically changed construction practices, indicates that homeowners on Oahu prefer CFS framing by a 2 to 1 margin over treated wood or concrete (see resources to right for full report). The provisions of the International Residential Code (IRC) lists six options that are acceptable for termite protection. At least one of these options are required in all residential buildings. Note that the International Building Code (IBC) is not nearly as specific about termite protection for commercial buildings. Since termite don’t discriminate between building types, the IRC requirements are good guidance for all building.